Besides the (almost) weekly TTC closures, there are upcoming road closures in Toronto this weekend because of special events and road work. Of note, on Remembrance Day, the TTC will pause all service at 11 am for two minutes to honour those who have died in service. 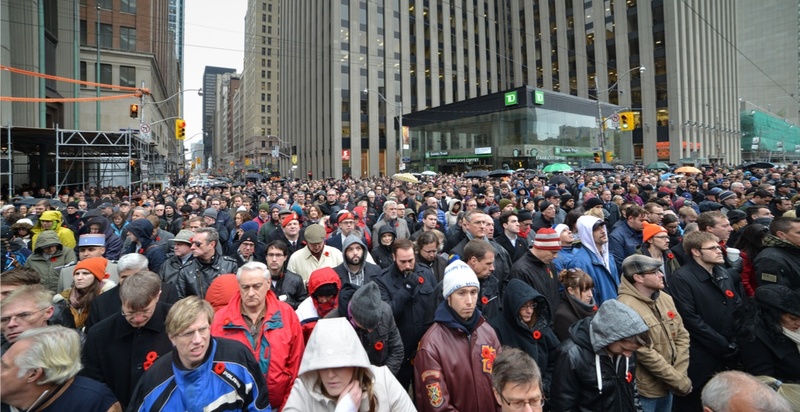 Current members of the Canadian Armed Forces in uniform, as well as Canadian war veterans and peacekeepers wearing military service medals/ribbons, can ride the TTC free of charge on Remembrance Day. One companion will be allowed to ride for free, as well. • Queen Street West from Yonge Street to York Street. • The north and south curb lane will be closed on Queen Street East from Jarvis Street to Sherbourne Street on Saturday, November 11 from 7 am to 4 pm. Bloor Street East from Church Street to Ted Rogers Way will be closed on Saturday, November 11 from 10 am to 11:30 am for the Queen’s Own Rifles of Canada ceremony and parade. • The eastbound curb lane on King Street between Bathurst Street and Jarvis Street will be closed from 10 am until 6 pm. • The westbound curb lane on King Street between Bathurst Street and Jarvis Street will be closed from 6 pm until 2 am. • Road users should expect delays due to traffic control signal activation on King Street between Bathurst Street and Jarvis Street from 5 am until 1 pm. During the King Street Transit Pilot project (approximately one year), there will be no parking on King Street between Bathurst Street and Jarvis Street, effective Friday, November 10 at 5 am.